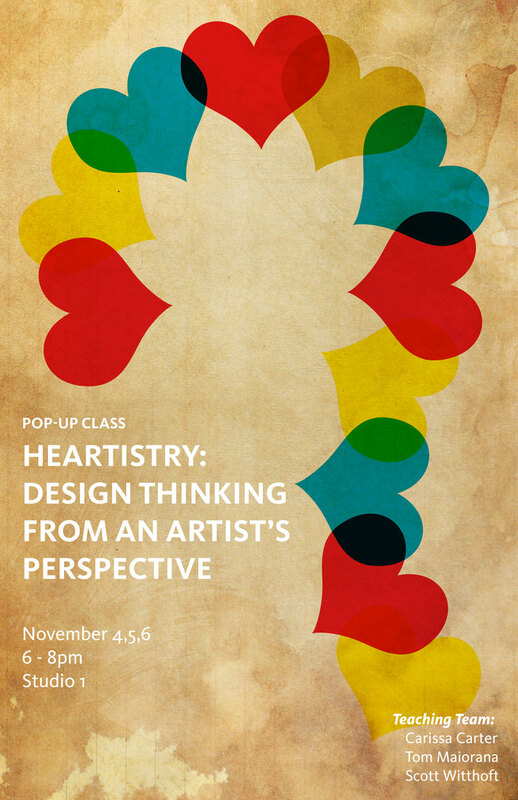 I’m happy to be teaching another pop-up class this quarter at the d.school. Co-teachers, Carissa Carter, Scott Witthoft and I will explore alternative ways to get to the meaning and insights that are the lifeblood of innovative products. You can’t get to breakthrough innovation by being safe. Artists are versed in going to vulnerable places in search of meaning, truth, and beauty. This class will approach a design problem from an artist’s perspective and utilize design thinking as a way to enhance the craft, aesthetics, meaning and ability to provoke thought. Students will make objects using a highly constrained medium in response to a topic area. We will then discuss the artifacts and explore the connection between design thinking and the creative process. No prior artistic ability is required for the class, but you will need to come prepared to think with your hands and explore objects and challenges in new ways.